IAM national leaders today marched in solidarity with IAM Local 86 members in Spokane, WA, who are in the second week of a lockout at Triumph Composites Systems. IAM International President Bob Martinez and Western Territory General Vice President Gary Allen also met with local union representatives to assure them they will have the support and resources they need to prevail. On May 9, Local 86 members voted by 94 percent to reject a contract offer from Triumph that failed to restore deep concessions taken from workers in 2013. The company further angered workers by stating it would continue to send work to Mexico. 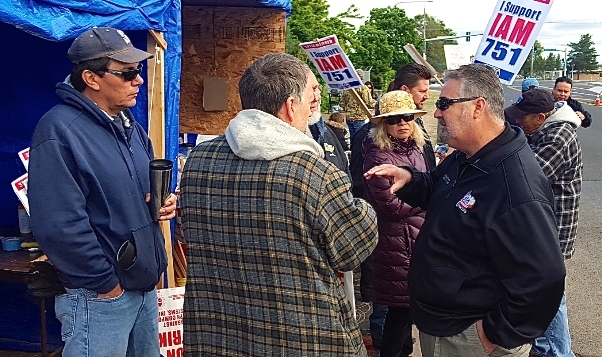 IAM District 751 President Jon Holden, who joined Martinez and Allen on the picket line, called on Triumph to immediately suspend its use of strikebreakers and resume good faith bargaining. “This dispute will be settled once management recognizes the hard work and dedication of the skilled workers who earn Triumph millions of dollars every day,” said Holden. Visit the IAM Eastern Washington Facebook page for updates and photos as the strike develops.